FV204 Centurion Mk IV: an improved variant of the Mk II fitted with a Leyland-Orenda Ursa 810hp D.X V-12 diesel engine and minor changes to the internal turret layout and improved fire-control equipment. To enter service during 1948. FV310: An armoured carrier variant of the FV300 series light tank chassis using the hull of the FV308 Field Artillery Tractor to carry eight infantrymen. Armed with one roof-mounted TADEN LMG. These will equip infantry units within Armoured Divisions leaving the open-top Oxford for Infantry Divisions. To enter service during 1948. FV3802: An armoured self-propelled 25pdr gun, chassis uses Centurion components. Will complement the lighter FV304 25pdr SPG. To enter service during 1948. FV3804: Ammunition Vehicle, chassis uses Centurion components. To enter service during 1948. Ordnance QF 3.7in Mk VI: this new model is a Mk V gun fitted with a 16-round autoloader to increase the rate-of-fire. To enter service during 1948. AMES Type 22: a GCI/COL set similar to the AMES Type 11 height-finder set. To enter service during 1948. AMES Type 28: CMH, an Air transportable Height Finder set for overseas use. To enter service during 1948. FV307: a mobile Radio-Location carrier. Entering development, planned to enter service in 1949. FV311: an armoured load carrier variant of the FV310 to carry cargo and ammunition. Prototype under test, planned to enter service in 1949. 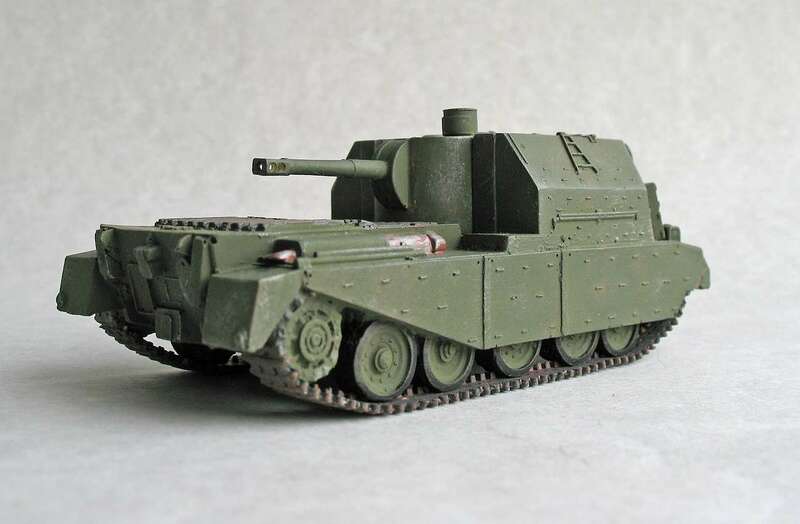 FV3806: An armoured self-propelled 7.2in gun based on the FV3802. Prototypes under test, planned to enter service in 1949. FV4224: A replacement for the Armoured Engineer Chassis (A26) based on the Centurion chassis fitted with the 6.5in demolition gun, hydraulic bulldozer blade and attachment points for various equipment to be pushed or towed. Prototypes under test, planned to enter service in 1949. FV601: An armoured car under development by Alvis as part of the 600 series of 6x6 wheeled armoured vehicles. This large 6x6 armoured car will be armed with a new 76mm low-recoil gun and two MGs and powered by a 170hp Rolls-Royce B80 petrol engine. In design stage. FV603: An armoured personnel carrier under development by Alvis as part of the 600 series of 6x6 wheeled armoured vehicles. This large 6x6 armoured personnel carrier will carry ten infantrymen and will be armed with an MG turret (as fitted to FV701 Ferret) and a TADEN MG above the rear hull roof hatch and powered by a 170hp Rolls-Royce B80 petrol engine. In design stage. FV701 Ferret: a Scout Car under development by Daimler since 1946. Prototypes under test, planned to enter service in 1949. FV401 Cambridge Carrier Tracked No.3 Mk I: Under development by Rolls-Royce since 1946 as an improved Oxford with simpler box hull with sloped frontal glacis and new torsion-bar suspension and a 160hp Rolls-Royce B80 petrol engine. The Cambridge can carry eight infantry and two crewmen with provision for one TADEN LMG for self-defence and 25-12mm thick armour. Prototypes under test, planned to enter service in 1949. 76mm L5: A low-recoil, lightweight gun for use in armoured cars and light tanks for engaging fortified positions and light vehicles. Will fire HE, AP and HESH rounds. In development since 1946, bench firing trials begun, prototype guns to begin firing trials in 1949. AMES Type 26: a GCI MEW (Microwave Early Warning) set. In early development. Control Type 10: for ground-control use, range 90 miles, should complete development in 1949. Chain Home Extra Low Type 16: an updated AMES Type 14 mobile set with 45 miles range. In development. Adding a machine gun to my development items, due to my oversight in fielding a credible MG for armoured vehicles. The result is the Besa, the only difference being in WW its a UK developed weapon rather than a development of a Czech weapon. I'm not sure if I'll make a heavier cartridge version or not at this stage. 7.92mm BESA Medium Machine Gun No.2 Mk I/ Mk I*, development of this new machine gun by the Birmingham Small Arms Company to replace the venerable Vickers Mk. I began in late 1948 and the first prototypes began firing trials in 1949. The gun was designed principally for use in armoured vehicles, either as a fixed co-axial weapon or as a pintle-mounted weapon for AA use. As the Royal Armoured Corps supply chain is separate, it was decided to adopt a new cartridge for use in armoured vehicles, the 7.92mm x 57 Mauser. The gun entered full scale production in 1950.